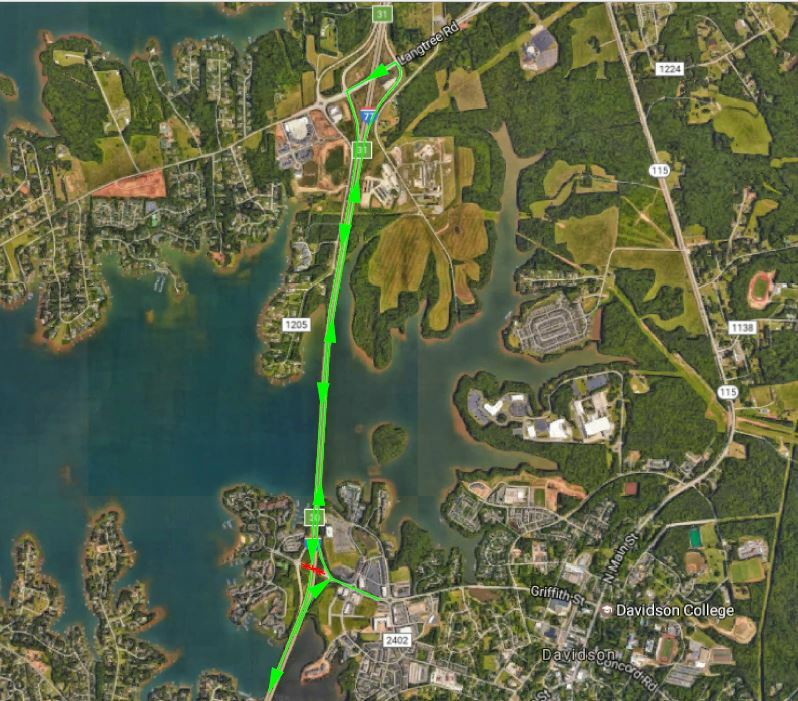 Project Description:The Exit 30 Bridge and Roundabouts project will enhance exit 30 by constructing two (2) roundabouts and updating the bridge over I-77. At each on/off ramp a roundabout will be constructed. In addition to creating a new bridge, new pedestrian facilities will be built along each roundabout and the bridge. The travel lanes will be 12 feet, Sidewalks will be 6 feet, and the bike lane will be 5 feet. Current Status: This project is currently under construction and is expected to be completed in 2019. 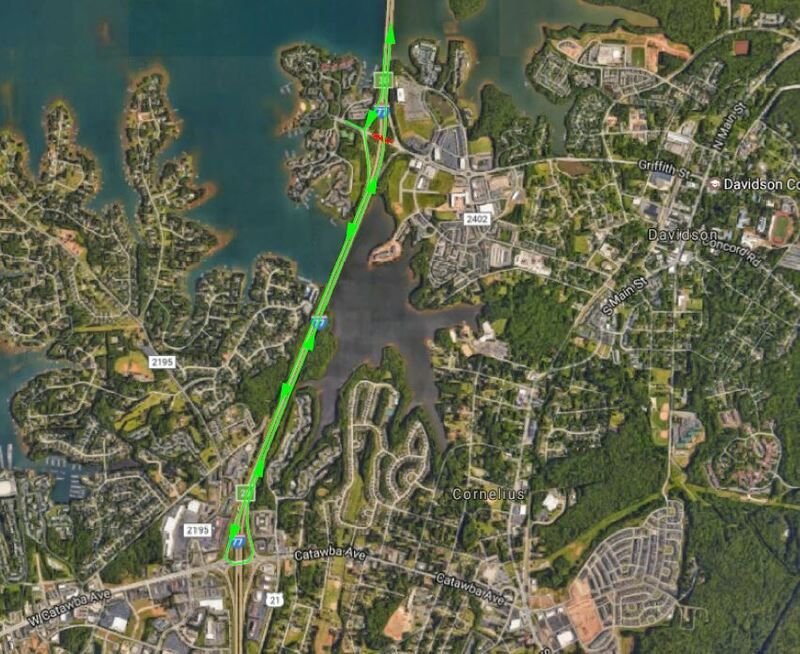 Crews to shift traffic to the newly constructed first half of the Griffith Street bridge and begin demolition of the current bridge at Exit 30 in Davidson. Charlotte, N.C. (October 17, 2017) – Beginning Thursday, October 19, 2017 construction crews will begin implementing a traffic shift on the Griffith Street bridge at Exit 30 in Davidson from the current bridge to the newly constructed bridge. This process, scheduled to take place during overnight hours, will take place in several steps and allow construction crews to open the newly constructed bridge and begin demolition of the current bridge. Monday, October 23 to Friday, October 27 from 11:00 p.m. to 5:00 a.m.
Monday, October 30 to Friday, November 3 from 11:00 p.m. to 5:00 a.m. Motorists travelling southbound on I-77 will be routed onto the Exit 30 exit ramp and down the entrance ramp back onto I-77 southbound. *Northbound traffic on I-77 will experience a lane closure. Monday, November 6 to Friday, November 10 from 11:00 p.m. to 5:00 a.m.
Monday, November 13 to Friday, November 17 from 11:00 p.m. to 5:00 a.m. Motorists heading north on I-77 overnight will be routed onto the Exit 30 exit ramp and down the entrance ramp back onto I-77 northbound. *Southbound traffic on I-77 will experience a lane closure. Sugar Creek Construction and I-77 Mobility Partners are coordinating with the town of Davidson and area emergency responders to ensure efficient response during these detours. Motorists are encouraged to pay attention when approaching the work zone, obey the posted speed limit and work zone signs, and allow extra time to reach their destinations safely. Once the new Exit 30 Griffith Street bridge is completed, it will have improved pedestrian access with the addition of bike lanes and sidewalks. We encourage people to sign up to receive lane closure and traffic advisory information and the latest information on the project. Once the project is complete, dedicated express lanes will run adjacent to the existing general purpose lanes. The number of general purpose lanes will remain the same as today. Drivers will have the choice of using the express lanes to avoid travel delays, the general purpose lanes, or a combination of both. Vehicles with three or more occupants (including the driver) and equipped with a transponder may use the express lanes for free. The 26-mile project is scheduled to open before the end of 2018. Project to be completed in 2019.